The newly announced Motorola RAZR i is now available for pre-order from Clove and Expansys. Update – Expansys tell us that the RAZR i will be available and ready to ship on Monday 1st October. Order the RAZR i here. The handset with a 4.3″ edge to edge Gorilla Glass screen with a splash guard coating has an 8mp camera and is Motorola’s first handset powered by an Intel chipset. Intel Inside® boosts the performance of your browser, Google Apps™ and camera while delivering great battery life. Motorola RAZR i’s instant-launch 8-megapixel camera can capture 10 pictures in less than a second – making sure you never miss a moment. Stay mobile for longer with its impressive up to 20 hours of mixed usage time1 and maximize every last ounce of power with Motorola’s unique SMARTACTIONS™ app. 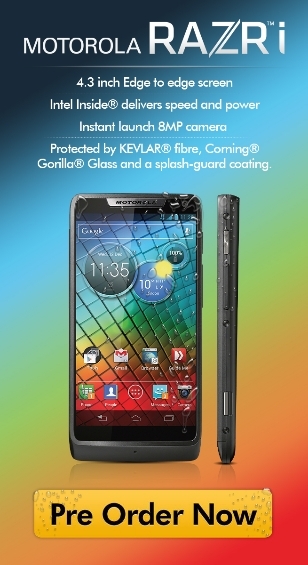 And because RAZR i is part of the Motorola RAZR family, it’s built with premium protective materials like Corning® Gorilla® Glass, DuPont™ KEVLAR® fibre2 and a splash-guard coating, which protects even the electrical boards inside.